Planning a trip should be fun and enjoyable! Unfortunately, when it comes to packing, this isn’t always the case. Many travelers struggle with finding the right luggage to meet their traveling needs. This can be especially difficult for all you ladies struggling to find the right tote to take on your trip. I mean, we already have a hard enough time picking out which outfits to bring, why make the packing process any more difficult than it needs to be? But don’t worry, we have compiled our favorite travel totes for just about any trip imaginable! Look no further, your dream tote awaits! Try the Women Travel Tote Bag. This tote is made with high-quality canvas, making it durable for your weekend of fun. Measuring up to 16 inches long, this back is the perfect size to fit all your weekend necessities. Pack a couple of outfits, your makeup bag, hairdryer, and still have room for a pair of shoes! Another great feature to the Camtop Tote Bag is the option to remove the shoulder strap AND in addition, has an open back slot to slide right onto any additional luggage. Whether you’re driving to your friend’s house for the weekend or flying to New York for a savvy business trip – this bag is the perfect fit for you! Did we mention that it comes in five different colors? So, ditch your boring overnight duffle and upgrade to this durable, long-lasting fashionable tote! We’re thinking big, blue, and waterproof! The QOGiR Neoprene Multipurpose Beach Bag Tote is the perfect option for any beach trip! The waterproof material means that you don’t have to worry about the items in your bag getting wet or the bag itself being ruined by water stains. The bag is sure to fit multiple beach towels, sunscreen, a few snacks, and your other beach essentials. This bag also features a removal board in the bottom lining. Having the board makes the bag more durable for packing and allows the bag to keep from tipping over. This beach tote is also equipped with high-end magnetic buckles which means that you don’t have to worry about your bag flipping over and losing its’ items. Say goodbye to your boring beach tote of 10 years and upgrade to this durable and waterproof beach bag! If we know anything, it’s that organization is key for a weekend of camping! Our favorite travel tote for large travel capacity is the BuruisQOGiR Neoprene Multipurpose Beach Bag Tote. Did we just say foldable? Yup! When you are not using this travel tote, it folds into a compact wallet-size bag. What we love most about this bag is the size and its ease for organization. Many users have suggested adding packing cubes to keep everything in place. What you will love most about this bag is the size. While camping may not require a lot of excess equipment, you will find that you will probably be able to fit everything you need in this bag. This bag is also great for those trips when you think you might be bringing home more than what you came with. Because it folds down, you have the option to bring it on your trips without worrying about it taking up space. And if you decide you need it, you have it! 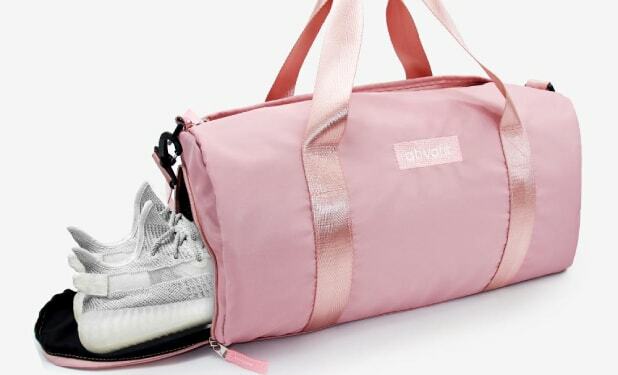 We highly recommend the Ativafit Woman Gym Bag with shoe compartment. Finally, a bag where you can keep your shoes separate from the rest of your clothes! If there is anything we understand it’s that the ground is dirty, and your shoes are constantly playing in that filth. This gym bag has a side compartment that keeps them from touching the rest of your clothes. Along with the shoe compartment, this tote is equipped with a plastic-lined compartment which is perfect for any extras you plan to bring along, such as toiletries. And, as if it couldn’t get any better, this bag is also waterproof. The waterproof material will keep any excess water from getting onto your clothes and also makes it easy to wash. If you’ve been searching endlessly for a gym bag that meets all of your needs, this is the tote for you! Headed to work or school? The Design Water Repellent Shoulder Laptop Bag is the best fit for you! No laptop? Not an issue. This bag is designed to stand in an upright position to keep papers and books from bending. What we love most about this bag is the easy-access to the main and side compartments. Picture this: you’re at school and your teacher tells you to write this down but you don’t have your pen or notebook out yet. However, because of your easy-access tote, it takes you about five seconds to grab your items and start taking notes! 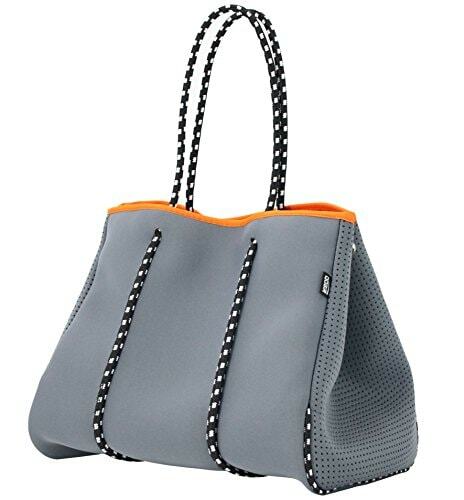 Another favorite feature of this bag is its’ versatile and fashionable appearance. Many laptop bags can be bulky and dull looking. But we have finally found a bag that any women would be happy to carry on her shoulder. Have we mentioned that this bag is a perfect size? Whether you need to carry your office around with you or want an extra bag for notebooks and your laptop, this bag will meet your expectations. Whether traveling for work, school or play we understand that how you carry your items is important. Not only do you want to make sure that your items stay dry, but you also want to make sure that you are using a durable tote that won’t rip while at the airport. Our list of totes have all had exceptional reviews on Amazon and we are confident that you will find the perfect tote for your traveling needs.